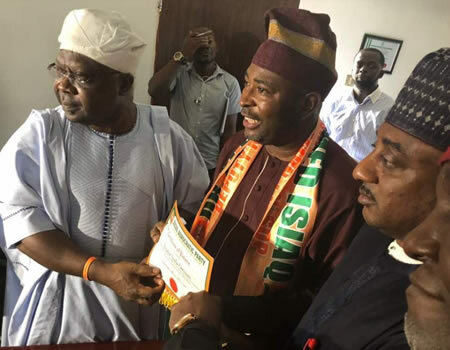 Senator Omisore receives certificate of return as SDP governorship candidate in Osun state – Royal Times of Nigeria. Ahead of the September 22nd Gubernatorial election, the Social Democratic Party (SDP) has presented its certificate of return to Senator Iyiola Omisore as its candidate in the September 22nd Governorship election in Osun State. The Deputy National Chairman of the Party, Dr Maishaq Abdul, who on behalf of SDP National Chairman, Chief Olu Falae, presented the certificate of return to Omisore, in Abuja, declared that the party is already prepared to win the Osun governorship election. Omisore in his reaction who boasted in his party’s integrity qualifying it to win the election said the SDP will not distribute money to the electorate for the party to win the forthcoming governorship election in Osun State. Meanwhile, Suspended PDP stalwart Senator Buruji Kashamu says his expulsion from the Peoples Democratic Party(PDP), by the National Executive Committee(NEC) of the party will not stand. Senator Buruji Kashamu who alleged that due process was not followed as enshrined in the Constitution of the party added that there are two suits challenging his initial suspension.The lawmaker also maintained that expulsion did not have anything to do with him or any of his associates. It will be recalled that PDP on Monday announced the expulsion of Senator Buruji Kashamu from the party. Others expelled from the party include Samiu Sodipo, Dayo Adebayo and Segun Seriki.